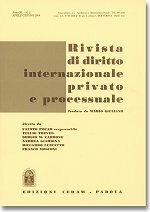 The fourth issue of 2012 of the Rivista di diritto internazionale privato e processuale (RDIPP, published by CEDAM) was just released. It features three articles and two comments. In the first article, Bruno Nascimbene, Professor of European Union Law at the University of Milan, offers a critical appraisal of fair trial and defense rights in antitrust proceedings before the Commission (“Equo processo e diritti della difesa nel procedimento antitrust avanti alla Commissione: necessità di una riforma?”; in Italian). In the second article, Luca G. Radicati di Brozolo, Professor of International Law at the Catholic University of Milan, discusses non-national rules and conflict of laws in light of the Unidroit and Hague principles (“Non-National Rules and Conflicts of Laws: Reflections in Light of the Unidroit and Hague Principles”; in English). In the third article, Manlio Frigo, Professor of International Law at the University of Milan, addresses the analogies and differentiations of, respectively, insolvency of undertakings and insolvency of States (“Insolvenza delle imprese e insolvenza degli Stati: analogie ed elementi di differenziazione” in Italian). Giulia D’Agnone (Ph.D. candidate in International Law at the University of Macerata), “L’interpretazione delle clausole sui waiting periods nella giurisprudenza dei tribunali ICSID: obblighi o raccomandazioni?” (The Interpretation of Clauses on Waiting Periods in the Case-Law of ICSID Tribunals: Obligations or Recommendations? ; in Italian).